When you first start up Adobe Photoshop Elements 8, whether you’re new to Photoshop Elements or have upgraded to the latest version, you need to know how to get around the workspace. The following figure introduces you to the key features; check out the bullets for tips on how to use these features. Open an image in the Photoshop Elements 8 Edit Full mode by choosing File → Open. Get information about your image by looking at the Photoshop Elements status bar. Click the right-pointing arrow to get more details regarding your document. Need to see detail in your image? In Photoshop Elements, you zoom into your image by pressing Ctrl+spacebar and clicking. Zoom back out by pressing Alt+spacebar and clicking. 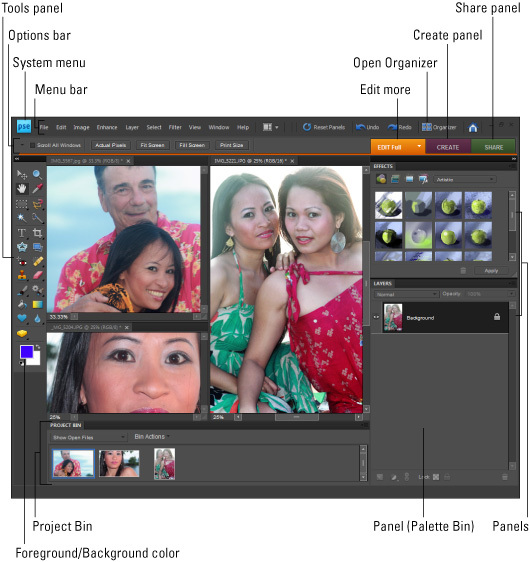 More recent versions of Photoshop Elements use panels. Access panels as needed by choosing them from the Window menu or the Panels Bin. You use panels in Photoshop Elements to create effects, work with layers, and much more. In Photoshop Elements for Windows, show files from the Organizer by selecting options in the Show Open Files drop-down menu in the Project Bin. In Photoshop Elements 8 for Mac OS you can view your photos in Adobe Bridge. Select the photos you want to edit and right-click (or Control-click) and choose Open With. From the submenu, choose Adobe Photoshop Elements 8.0.